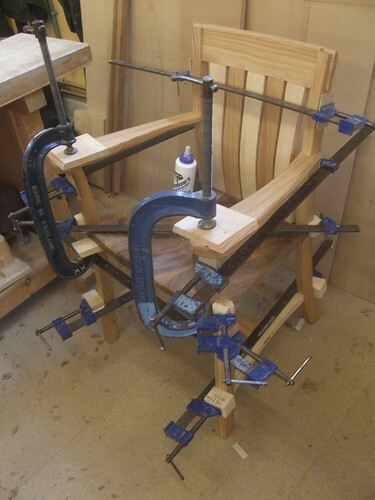 If you’re anywhere near Bristol or the south west of England within the next couple of months, it would be worth keeping an eye out for three furniture exhibitions. Two of these shows follow on from similar events that took place a year earlier. Sadly, due to financial reasons, I’m unable to take part this year. But, if these show are anything like what was witnessed last year then, you won’t want to miss them, if you have the opportunity to pay them a visit! ‘Inspired’ – The Great Oak Hall, Westonbirt Arboretum, Tetbury. ‘Furnish 2’ – Paintworks Event Space, Bristol. 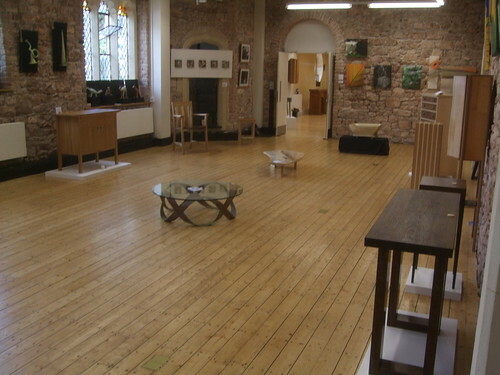 ‘Inspired’ – The Hayloft Gallery, Ashton Court Estate, Bristol. Of course, there is also one annual show for this region that I haven’t mentioned above and that’s the acclaimed Celebration of Craftsmanship & Design in Cheltenham. But, that’s not until the end of August. With just two-days left to run on this one, I thought it was about time I got around to providing you with a bit of an update and a few photos of what you’re missing out on if you haven’t been already. Just a brief note, this one, to say that the ‘Inspired‘ exhibition at the Ashton Court Estate (Bristol) opens this morning. Hours are 10.00-16.30 daily, with the show closing next Sunday afternoon (25th). All are welcome and, if you’re in the area at all over the next eight-days, it’s definitely worth a look. Not only for that, but also, the grounds and mansion itself are worth a look, if you haven’t visited before. Just follow the signs in to the Visitor Centre and the exhibition space is upstairs in the Hayloft Gallery. Along with all the fine furniture, there is some art and carved/sculpture work. Unfortunately, I don’t have any photographs for you at the minute as the layout was still being organised when I dropped my two pieces off yesterday morning. I should be there Thursday and Friday though and I’ll update this thread/add a new post as necessary. 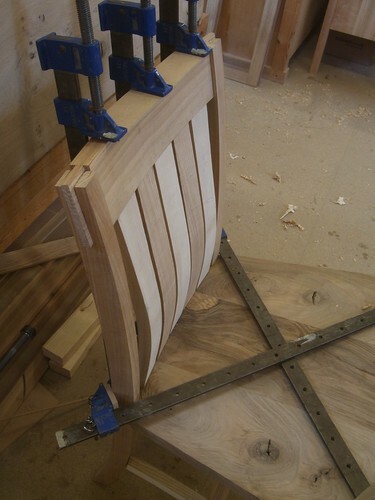 Since the last update on the side table I’m building, I’ve got to the position now where the frame is all glued up and I’m now well in to working on the quartered walnut-veneered top. 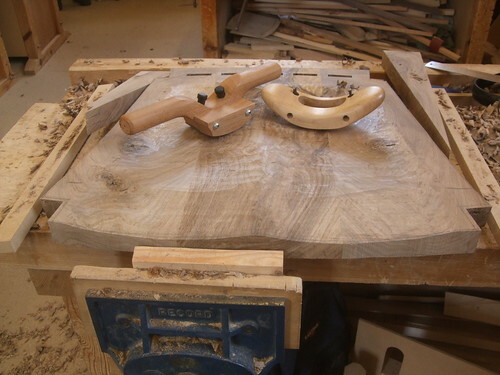 While I’ve kept my progress posts updated regularly on a couple of UK woodworking forums, I do apologise for not keeping you guys better informed here, on my blog – it’s just that, I’ve learnt so much from the forums over the years that I feel like I almost ‘owe’ them something in return… Sorting through my images and typing all that text can take a good hour, after which, there aren’t always enough hours in the day to start blogging (it is World Cup season, after all!! 😀 …No, as an Englishman, I probably shouldn’t be smiling, at this point!). 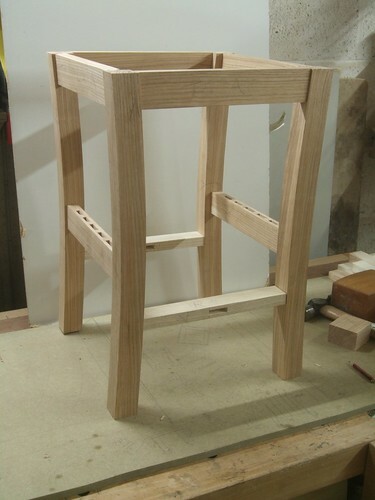 With two July exhibitions looming and a stack of 2in ash left over at college, I’m currently at the design stage for a side table to go with the “Two Tone Throne” [or, chair!!] that I’ve been making this year. My chair will feature at both exhibitions although, as I’m paying a bit extra for the Inspire show (several days after Furnish) and each maker/artist is allowed to exhibit two pieces, I feel it makes sense to try and produce one other piece within the time I have left; something that won’t have been exhibited elsewhere.